Founded in the late 80’s, Nor-Tech set out to build exclusive products not available from existing production or custom boat builders starting with the 5000 V hull. In the early days the company was focused on delivering a handful of high-end custom machines. Each passing year was marked with more improvements, refinements and increased capacity. The 3800 V bottom was added, then in 1999 the first 5000 Supercat was introduced. Today Nor-Tech has the most complete line of custom products of any hi-performance. Starting with the new 3900 Super V, the 4300 and the venerable 5000. On the Supercat side we offer the highly successful 3600, the newer 4300 and of course, the 5000. Development continues with the 80’ Superyacht series, filling the need for a large luxury performance yacht. 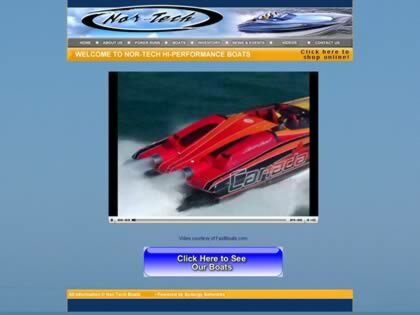 Web Site Snapshot: If available, above is a snapshot of the Nor-tech web site at http://nor-techboats.com/ as it appeared when this site was added to the directory or last verified. Please Note that Boat Design Net has no involvement with the above web site; all content and images depicted in the above thumbnail are the property and copyright of Nor-tech unless otherwise noted on that site. Description: Founded in the late 80’s, Nor-Tech set out to build exclusive products not available from existing production or custom boat builders starting with the 5000 V hull. In the early days the company was focused on delivering a handful of high-end custom machines. Each passing year was marked with more improvements, refinements and increased capacity. The 3800 V bottom was added, then in 1999 the first 5000 Supercat was introduced. Today Nor-Tech has the most complete line of custom products of any hi-performance. Starting with the new 3900 Super V, the 4300 and the venerable 5000. On the Supercat side we offer the highly successful 3600, the newer 4300 and of course, the 5000. Development continues with the 80’ Superyacht series, filling the need for a large luxury performance yacht.